The Beatles 50 Years Ago Today: February 7, 1967. Beatles Radio: The Beatles, Solos, Covers, Birthdays, News The Fab 4 and More! To complete the "Penny Lane" clip, the Beatles returned to Knole Park during the late morning and filmed two final sequences; one in which they rode their white horses out through an archway in a ruined wall, and around the wall to their right; the other in which, despite the bitterly cold weather, they sat at a dinner table by the furthest of two nearby ponds and were served with their instruments by two bewigged men (one of whom was Mal Evans). 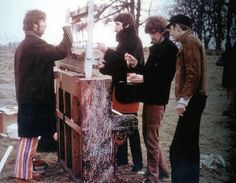 Following final editing, the superb promotional clips for "Strawberry Fields Forever" and "Penny Lane" were quickly distributed/sold to important television stations around the world. In Britain they were screened mostly by the BBC - a 1 minute 10 seconds extract from "Penny Lane" was shown on Juke Box Jury on Saturday, February 11th.